It’s only been 2 weeks since I released the last update of this MP (version 1.1.0.0). Soon after the release, Mr. David Allen, a fellow System Center CDM MVP contacted me, asked me to test his SCCM Compliance MP, and possibly combine it with my ConfigMgr 2012 Client MP. In the ConfigMgr 2012 Client MP, the OVERALL DCM baselines compliance status are monitored by the DCM Agent class, whereas in David’s SCCM Compliance MP, each DCM Baseline is discovered as a separate entity and monitored separately. Because of the utilisation of Cook Down feature, comparing with the approach in the ConfigMgr 2012 Client MP, this approach adds no additional overhead to the OpsMgr agents. David’s MP also included a RunAs profile to allow users to configure monitoring for OpsMgr agents using a Low-Privileged default action account. I think both of the features are pretty cool, so I have taken David’s MP, re-modelled the health classes relationships, re-written the scripts from PowerShell to VBScripts, and combined what David has done to the ConfigMgr 2012 Client MP. 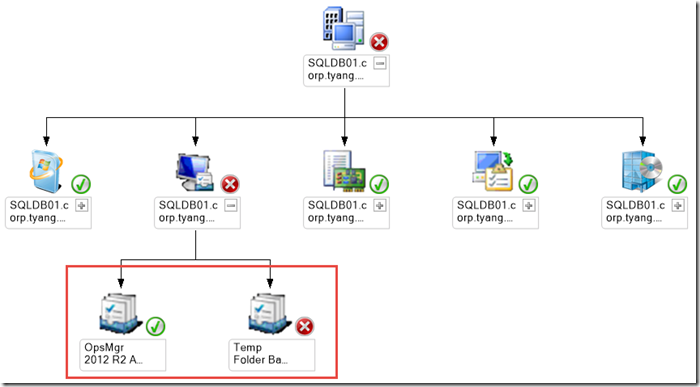 If you (the OpsMgr administrators) are concerned about number of additional objects that are going to be discovered by this release (every DCM baseline on every ConfigMgr 2012 Client monitored by OpsMgr), the DCM Baselines discovery is disabled by default, I have taken an similar approach as configuring Business Critical Desktop monitoring, there is an additional unsealed MP in this release to allow you to cherry pick which endpoints to monitor in this regards. Version 1.2.0.0 has introduced a new feature that can monitor assigned DCM Compliance Baselines on a more granular level. 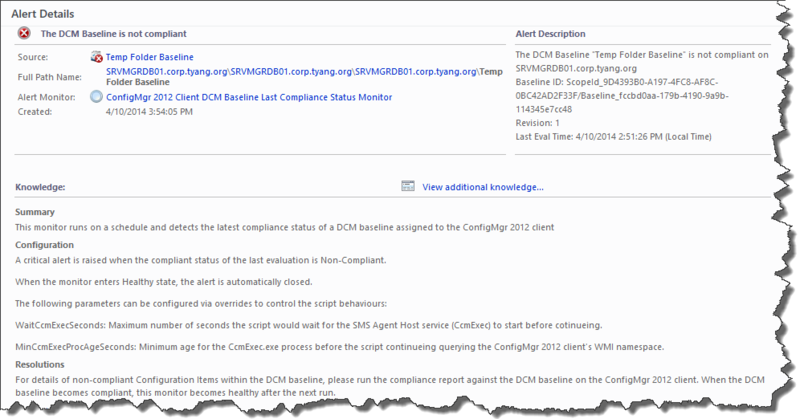 Prior to this release, there is a unit monitor targeting the DCM agent class and monitor the overall baselines compliance status as a whole. Since version 1.2.0.0, each individual DCM baseline can be discovered and monitored separately. By default, the discovery for DCM Baselines is disabled. 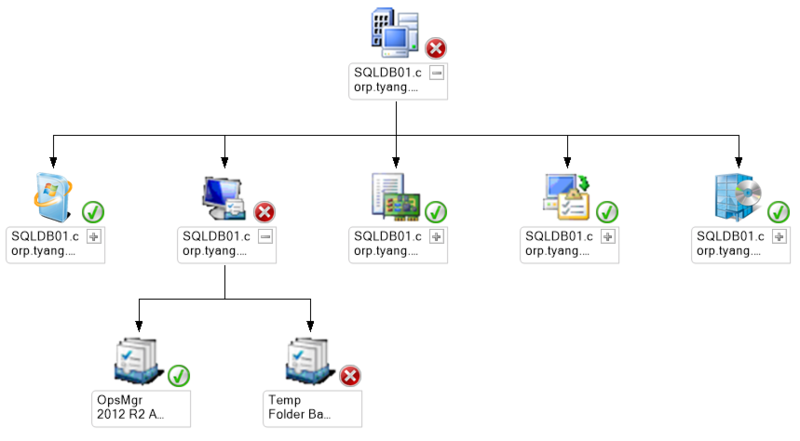 It needs to be enabled on manually via overrides before DCM baselines can be monitored individually. Note: Once the DCM Baseline discovery is enabled, please also disable the “ConfigMgr 2012 Client DCM Baselines Compliance Monitor” for the same targets as it has become redundant. 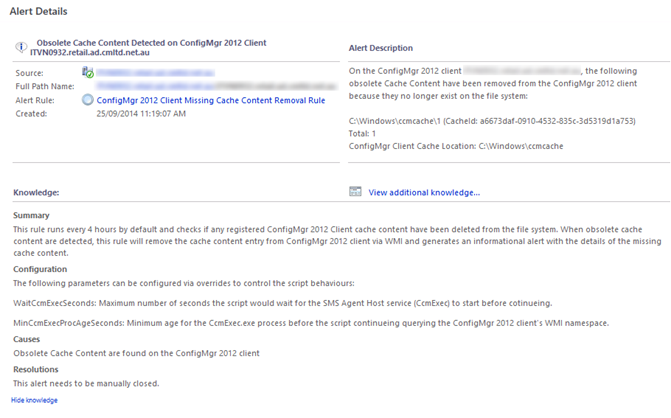 An override to enable DCM baseline discovery for “All ConfigMgr 2012 Client DCM Agents on Server OS” group. 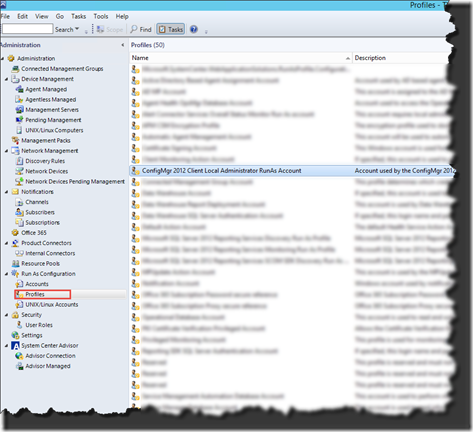 An override to disable the legacy ConfigMgr 2012 Client DCM Baselines Compliance Monitor for “All ConfigMgr 2012 Client DCM Agents on Server OS” group. 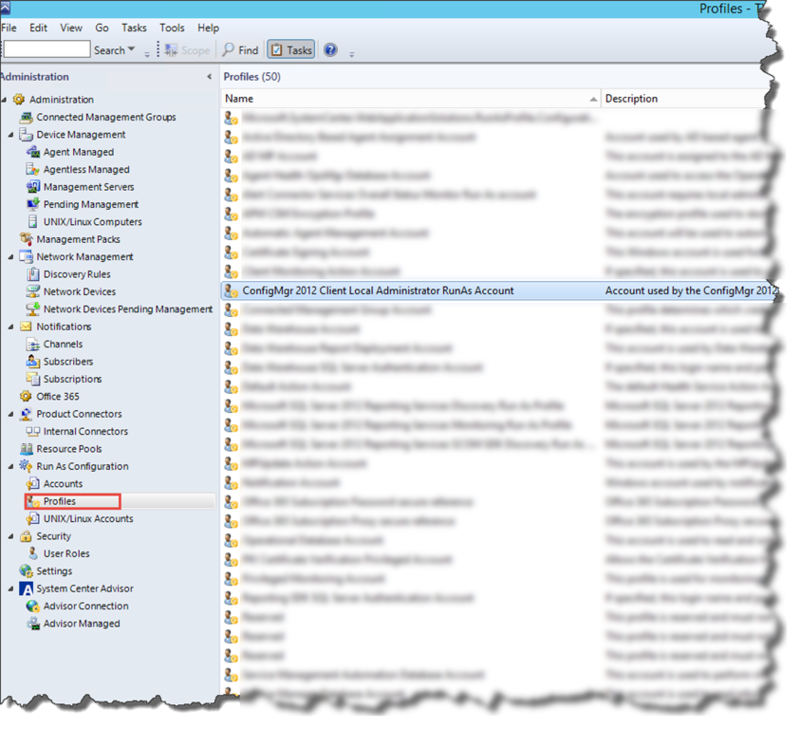 An override to enable DCM baseline discovery for “All Business Critical ConfigMgr 2012 Client DCM Agents” group. 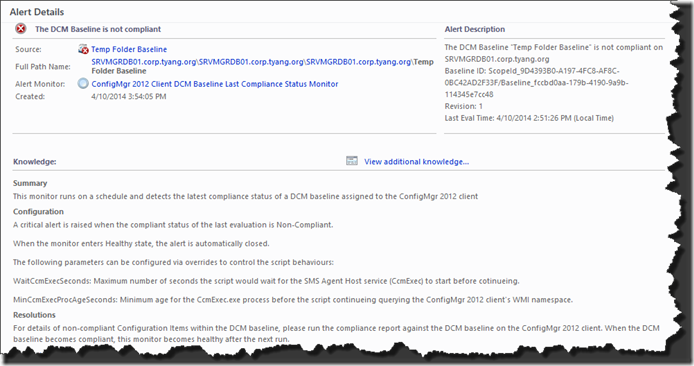 An override to disable the legacy ConfigMgr 2012 Client DCM Baselines Compliance Monitor for “All Business Critical ConfigMgr 2012 Client DCM Agents” group. In summary, this management pack enables DCM baseline discovery for all ConfigMgr 2012 client on server computers and switch from existing “overall” compliance baselines status monitor to the new more granular compliance baseline status monitor which targets individual baselines. This management pack also enables users to manually populate the new “All Business Critical ConfigMgr 2012 Client DCM Agents” group. Members in this group will also be monitored the same way as the server computers as previously mentioned. 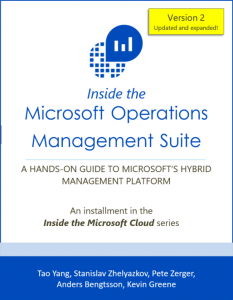 Note: Please only use this management pack when you prefer to enable enhanced compliance monitoring on all server computers, otherwise, please manually configure the groups and overrides as previously stated. 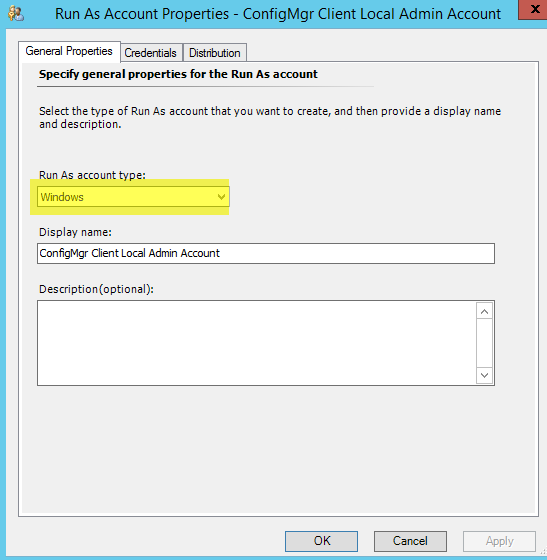 Since almost all of the workflows in the ConfigMgr 2012 Client management packs require local administrative access to access various WMI namespaces and registry, it will not work when the OpsMgr agent RunAs account does not have local administrator privilege. 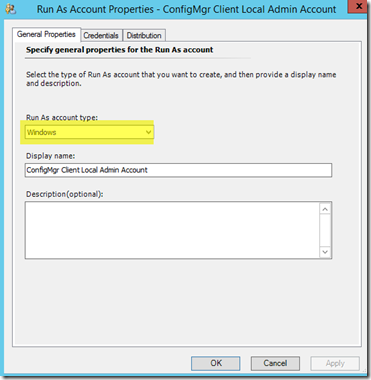 Separate RunAs accounts can be created and assigned to the “ConfigMgr 2012 Client Local Administrator RunAs Account” profile. 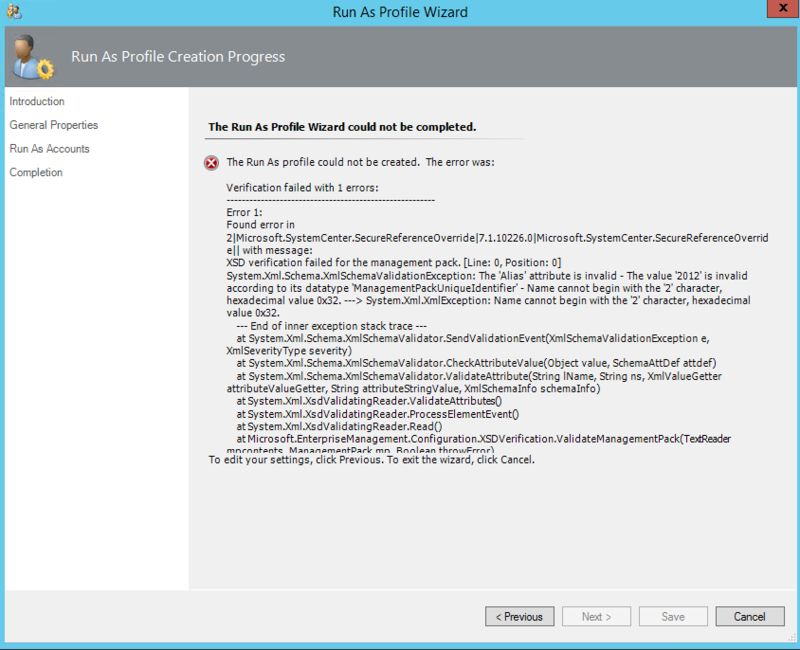 Please refer to the MP documentation section “14.3 Error Received when Adding RunAs Account to the RunAs Profile” for instruction on fixing this error. Note: I only managed to find high res icons for the Software Distribution Agent and the Software Update Agent (extracted from various DLLs and EXEs). I couldn’t find a way to extract icons from AdminUI.UIResources.DLL – where all the icons used by SCCM are stored. So for other icons, I had to use SnagIt to take screenshots of these icons. You may notice the quality is not that great, but after few days effort trying to find these icons, this is the best I can do. If you have a copy of these icons (res higher than 80×80), or know a way to extract these icons from AdminUI.UIResources.dll, please contact me and I’ll update them in the next release. 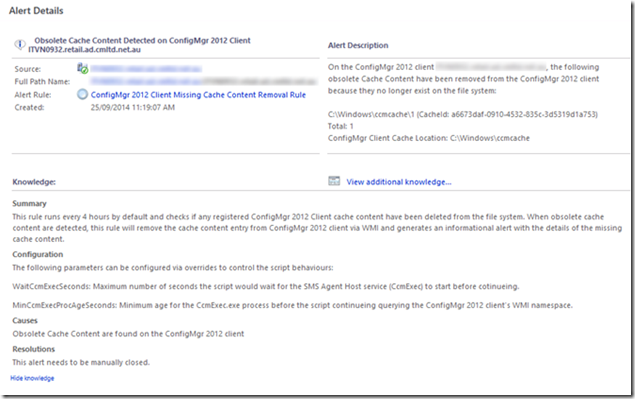 BIG thank you to David Allen for his work on the SCCM Compliance MP, and also helping me test this release! You can download the ConfigMgr 2012 Client MP Version 1.2.0.0 HERE. Until next time, happy SCOMMING! I just realised when I zipped the MP files 2 days ago, the override MP in the zip file did not have any references to other sealed MPs. I have updated the zip file. If you have downloaded the zip file prior to now and having issues with the override MP, please download it again. First and for all, thanks for this MP. 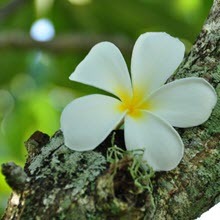 I think this will be an added value in our environment. You also included a monitor that checks if ccmexec is running. 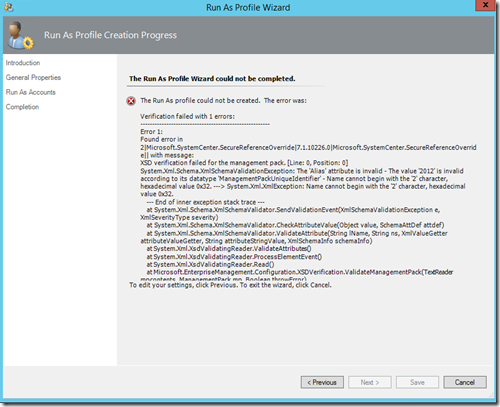 A task to start the service out of the ConfigMgr console would be nice. It’s rather easy to include that. I tried this MP out and it looks like all of our Windows 2012 R2 servers fail when CreateObject(“System.Random”) is called. I thought maybe it was a .Net version thing, but it doesn’t seem to matter which version(s) is installed. Ideas? I may unseal the MPs and rewrite the bits dependent on that function. There is a typo in the display string for the pending software updates alert message. It says udpates instead of updates. Generate an alert if the compliance for the “BL – Script – SQL Standards-ECTO SQL Servers” baseline deployment is below the following percent: 98%. The alert is canceled if the compliance level is equal to or greater than 98%. it seems like the Software Distribution agent and the Client software update agent requires .net framework 3.5 in windows 2012R2. is it really necesarry or could it be dependent on .net framework 3.5 and newer.. ?